In the life of each student there are things to criticize. Sometimes the number of assignments received exceeds the boundary of the reasonable. Here you can find help from academic writing services. There are different opinions about the work of their teams. Some believe that such sites undermine the education system and their principles are fundamentally wrong, others, on the contrary, see in them their lifebuoys in the storm of academic life. Everyone has the right to stick to their position and protect it. Our task is to provide comprehensive information about each of these sites so that the you could make a conclusion about whether you want to cooperate with such a resource or not. 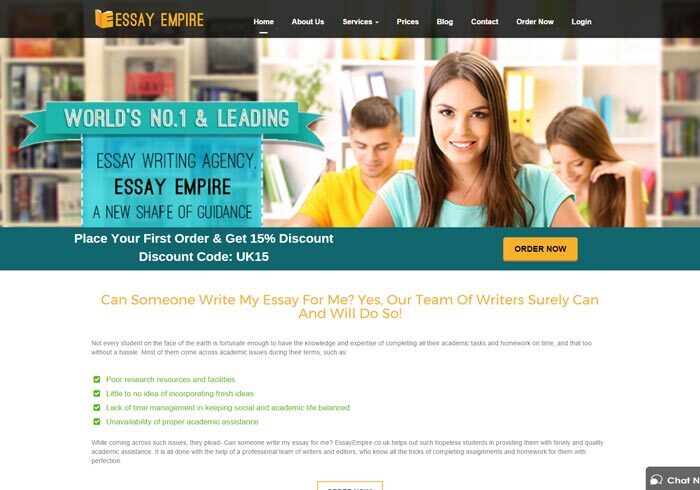 Today, our searchlight will illuminate the advantages and disadvantages the site Essayempire.co.uk, in case it has some. As soon as we get to the site, slight inconvenience of the design rushes into the eye. This is a translucent black site header which moves along with the scrolling and interferes with viewing the text. This is not such a big problem, but it is worth thinking of. The site offers a 15% discount for the first order. You can contact the support team via online chat, mail, a form on the site or by phone. It is unknown whether the phone call is paid. Instead, only the client's name, residence and response are present. All the reviews are enthusiastically positive, not informative in nature, and do not allow to draw a clear analytical picture about the company's work. On the main page, there are duplicate lists which, probably, were placed here for the client to see them better. In addition, different pages of the site are replete with forms of hidden psychological pressure, as everywhere they tell why you cannot write the work by yourself. For this fact, guys find a lot of reasons, although from the logical point of view this information could be omitted. Customers already decide for themselves that this or that paper is necessary for them, so there is no need to explain the reasons that have led them to this site. The content could be designed in a more rational way. Brevity Is the Sister of Talent? The personal data, which the site requests for the purpose of "the best communication". What kind of personal data do they want? Apparently, the client will have to learn directly while making the order, because there is not much information about this matter. The page with the policy about repayment looks like a page which is at one of the first stages of its development. Instead of revealing all cases of the refund, this causes makes even more confusion. There is no information about the possible revocation of the order and compensation, or about whether the company returns the money in case of an accidental double payment. And this is only the beginning. So, it is necessary for the guys here to revise the content of the site and focus not on the useless information, but on the one which is crucial for the future client.